Why can’t a small be a small and a large be a large? Once upon a time when you ordered a small drink you would get exactly that–a small-sized drink. Then somewhere along the line someone had a brainstorm and decided to do away with all the small-sized cups and make medium the new small. Order a small now and get a medium because that’s the smallest size; order a large and get an extra large. Are you following so far? It’s still confusing to me, so I still ask for a small and hope the person taking my order can translate it. As if that wasn’t confusing enough, Starbucks had to come along and re-define sizes altogether. They did away with small, medium, and large sizes and introduced the “tall” (small), the “grande” (medium), and the “venti” (large). 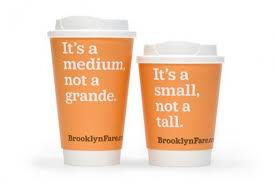 Rumor has it that the world-known coffee chain decided to re-name the small with tall so people wouldn’t be embarrassed ordering the small. I suppose I could see some men feeling uncomfortable saying, “I’d like a small one, please.” Asking for a tall doesn’t emasculate anyone, man or woman, and is even empowering. However, if you really want a normal-sized small drink, you have to specifically ask for a “short,” which is so mortifying that it isn’t even listed on the menu. Of course, the people ordering the medium need to feel positively as well, so medium has become the grande, which is Italian for large. The reverse logic, though, works for anyone asking for a large-sized drink. People don’t want to feel guilty that they’re splurging on a large, so the venti sounds a lot better. One thing to keep in mind about the venti is it’s a 20 ounce drink as long as it’s hot, but in the event that the drink ordered is a cold concoction, then it’s 24 ounces. Get it? I’m almost afraid to ask what would be the size of the “trenta,” the logically named 31 ounce drink, according to older sizing standards. Oh, well. I guess if I want a small drink, I better ask for a short because if I ask for a small, I’ll get a tall, and if I think a medium is a small and ask for a grande, I’ll really get a large instead. Why can’t we just keep sizes simple? A few things about us–I’m a native New Yorker from the majestic Hudson River Valley who moved to the beautiful Pacific Northwest in 2009. I love my day job working as a reference librarian in the Spokane, Washington area, helping people find answers to their questions and locate various library materials. As for “why,” he’s been living here, there, and everywhere for a long spell but never really put down roots until now. “Why” and I have gotten to know each other well through working together for quite some time. We first started teaching in academic institutions–colleges and high schools–before we decided to change direction and head into librarianship. It was in the library that we discovered sides of ourselves that we didn’t even know existed. I have to admit that “why” has been great to work with, always having something new and fresh to offer, but occasionally “why” has also tended to be a bit demanding and irritating. Despite the headaches “why” gives me from time to time, I still value him and all the reasons he gives me to write. Please make yourself comfortable in The House of Why and be sure to visit often!